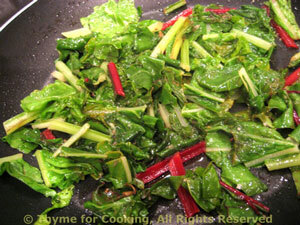 Swiss Chard, simply sauteed, summer recipes from Thyme for Cooking. Chard, or Swiss Chard, is a slightly bitter green, reminiscent of spinach. Both stems and leaves are eaten; some cultures preferring one over the other. We're democratic and eat it all. Add the chard and stir-fry over medium heat until it softens and fits into the skillet. Reduce heat to low and cook until tender, another 5 - 7 minutes. Drizzle with soy sauce, stir and serve.